Come on down to our Festival of Rugby at Chatswood Oval this Saturday, 13th April, for our first home game against Southern Districts. We’ll be supporting our great junior village clubs and the next crop of future stars from one of the best rugby nurseries in the country! 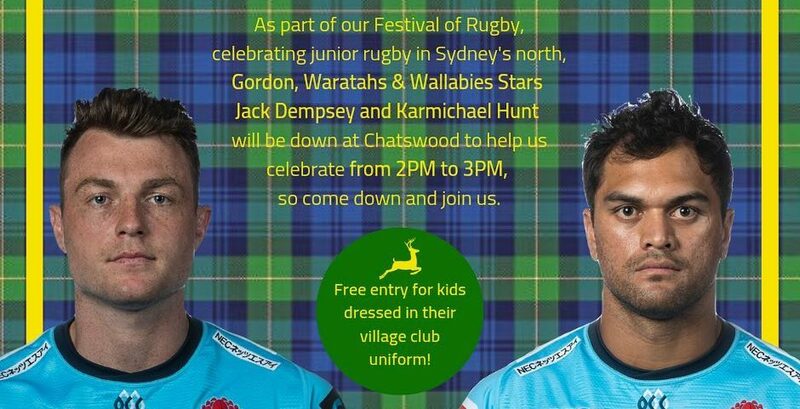 As part of our Festival of Rugby, Jack Dempsey and Karmichael Hunt will be at Chatswood Oval to help us celebrate. Free entry for kids in their village club gear. Don’t forget GRFC members receive $5 weekend parking from Secure Parking at the 67 Albert Avenue Car Park (using Promo Code GRC2019) when booked online by clicking here. Click here for our Grade Team Lists. Click here for our Colts’ Team Lists. Click here for the Intrust Super Shute Shield Media Release Round 1.